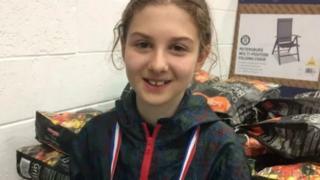 A search has been launched for a 13-year-old girl who left the UK on a Eurotunnel train. Serena Alexander-Benson was last seen by her father leaving her home address in Wimbledon at about 07:50 BST on Friday. She was wearing her green school uniform and told her father she was going to school - however she did not arrive and has not been seen since. Scotland Yard said it was concerned for the girl's welfare. It is believed that the girl left the country on Friday morning via Eurotunnel at Folkestone, Kent, "probably in the company of an older person", the force said. Police added that although Serena lives with her father in London, her mother lives in Poland.